A QUICKFIRE quiz. What do the following organisations have in common? Axa, the global insurance giant whose European arm makes annual profits of £3.6bn; VISA Europe, the association owned and operated by over 3,700 European banks, thought to be worth around £2bn; Barratt Developments, Britain’s biggest house-builder, which recently announced that its profits for the six months leading up to the end of December jumped 113% to £46.1m; and Scottish Borders Housing Association, a registered social landlord and charity with 184 staff which, on average, charges its tenants the modest sum of £244.80 a month in rent? The company has previously acted for clients even more notable, none of whom are listed on the public affairs register of the Public Relations Consultants Association. It has, for instance, represented the interests of energy and petrochemicals behemoth Shell in Nigeria, and worked for Francis Egerton, the 7th Duke of Sutherland, during the £50m sale of the peer’s Titian masterpiece, Diana and Actaeon, to the National Galleries of Scotland and the National Gallery, London. Everyday life in the quaint Royal Burgh of Selkirk and its surrounding environs, you might reasonably suspect, would be humdrum in comparison. Yet as of this week, Scottish Borders Housing Association (SBHA) has been a member of this illustrious roster, with press enquiries to the organisation being handled personally by Chelgate’s chairman and chief executive, Terence Fane-Saunders. As with Chelgate, few people north of the Southern Uplands have likely even heard of SBHA before. Governed by a board of management comprising one third tenants, one third council nominees, and one third independent community representatives, it took over ownership of 6,728 properties from Scottish Borders Council a decade ago last month. According to its own surveys, the vast majority of its tenants appear satisfied with the service it provides, and it is on course to meet the Scottish Housing Quality Standard by 2015. The reason for its incongruous addition to Chelgate’s clientele is a series of articles I have been writing in The Scotsman (see articles below) concerning Dr Eamonn O’Neill’s long-standing grievances against the association. 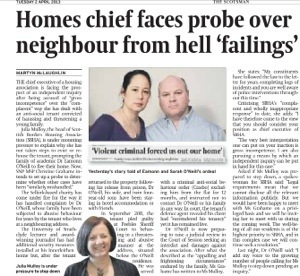 The academic and journalist’s complaints centred around why it could not evict a neighbour and SBHA tenant who pled guilty in court in September 2011 to threatening and harassing behaviour, and who was instructed not to contact the O’Neill family as a consequence. During the case at Peebles Sheriff Court, the tenant’s defence agent told the presiding sheriff, Kevin Drummond, his client had surrendered his tenancy. In spite of this, the tenancy remained live. Last Thursday, I asked SBHA a question I considered reasonable and straightforward. 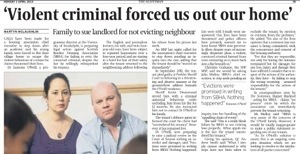 Why was the tenant not evicted? To date, I still do not know, as the query has never been directly addressed. Having liaised initially with SBHA officials, Mr Fane-Saunders has been dealing with my story since Tuesday. As revealed in The Scotsman today, the tenant in question has now departed the property following a “process of negotiation'” although the circumstances of his exit remain unclear. SBHA has declined to say whether he has been rehomed in another of its properties. 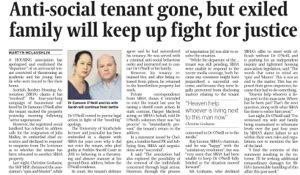 In a statement, issued through Chelgate, SBHA said that it was “unable to respond” to the media coverage while the tenant’s departure was pending, “both because any comment might have jeopardised a successful outcome, and because they were legally prevented from disclosing matters relating to the tenant concerned to Dr O’Neill or to the media.” Even though the tenant is now gone, SBHA is unable to offer further clarity, citing proposed legal action by Dr O’Neill. 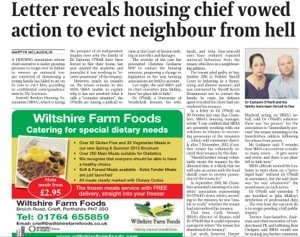 The case has raised questions over how SBHA deals with anti-social tenants. In the year to March 2012, SBHA initiated 55 court actions to see through the process of eviction. It was successful in 28 of those cases, but none concerned the issue of anti-social behaviour; indeed, all were for the non-payment of rent. Throughout the same period, however, the association received no fewer than 197 complaints regarding anti-social or nuisance behaviour. It applied for just 11 full ASBOs, and was granted only eight. On a wider scale, it has sparked debate about the hinterland of accountability which SBHA and other housing associations inhabit. Christine Grahame, the SNP MSP who has been supportive of Dr O’Neill’s cause, and who has called for chief executive Julia Mulloy to stand down pending an independent inquiry, was offered a meeting with the association’s officials on a “privileged basis,” without Dr O’Neill in attendance. She rejected the notion out of hand, reasoning that as it was a highly contentious constituency matter, her constituent ought to be present. Under its regulatory standards, the Scottish Housing Regulator states that a registered social landlord must be “open about and accountable for what it does.” It adds that governing bodies have “a wider public accountability to the taxpayer as a recipient of public funds.” The regulator rightly exists to protect the interests of tenants and those unfortunate enough to find themselves homeless, but not, unfortunately, everyone. Anomalies exist, an example being owner occupiers like the O’Neills, who are indirectly – and also very directly – affected by housing association issues. The lion’s share of SBHA’s £17m turnover comes from the rent it collects from tenants, but it also receives a grant from Scottish Ministers, a sum which totalled nearly £200,000 last year. That may not be regarded as an astronomical figure by those who scrutinise the nation’s purse strings, but allied to the association’s vital social services and responsibilities, it ought to be reason enough to expose it to the culture of transparency which pervades the greater part of the Scottish body politic. There has always been a good deal of money swishing around the Scottish Borders, but will we ever know just how much of it has gone to Chelgate?